Posted by Cyril. March 27th 2015. 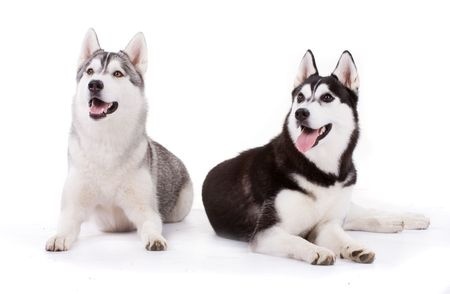 The Siberian Husky is a beautiful dog with a thick coat that comes in a multitude of colours. Easily distinguishable thanks to their vivid blue or multi-coloured eyes it is easy to see why so many dog lovers are drawn to this dog’s wolf-like looks and independent personality. Believed to have originated from Chukchi, a tribe of Siberian nomads, the history of the Siberian Husky is largely unknown. However, DNA tests have found that they are one of the eldest breeds known to man which could explain their uncanny physical likeness to wolves. The tribe Chukchi used the dogs for protection and often allowed them to sleep with the young children to offer both security and a comfortable bed. Later, in 1908, the Siberian Husky was imported to Alaska and used as a sled dog and from here it became a popular breed that was soon found throughout the world. 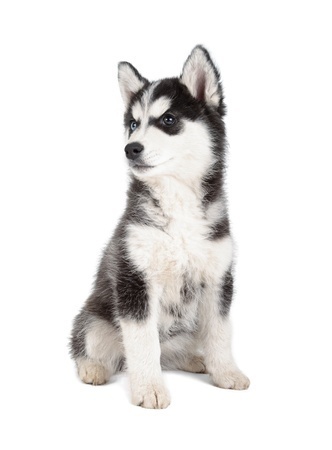 Siberian Husky dogs are easily identifiable thanks to their wolf-like appearance and bright eyes. Their coats are thick to protect them against the cold and they have strong, muscular bodies which allow them to pull heavy loads easily as part of a pack. On average, males stand 21-23m high and weigh 45-60lbs while females stand 20-22m high and weight 35-50lbs. The Siberian Husky is a beautiful dog that attracts plenty of attention – even that of filmmakers and artists. Siberian Husky dogs are pack dogs by nature and that means they require a strong hand from an owner who is not afraid to be the leader. Once the dog understands the hierarchy it will respect its owner wholeheartedly; making training a lot easier. The breed actually has an amazing ability to learn and is incredibly intelligent and one of the best ways to assert your authority is to make the dog eat its dinner after you. This ensures they associate you with dominance and power. Extremely high in energy and known for demonstrating destructive behaviour from time to time – especially in the garden – training is crucial with this breed, as is play. Around 30-60 minutes of exercise should be given to these dogs each day. This is opacity of the lens and results in blurred vision. Cloudy or grey-blue coloured eyes are common signs that a dog has cataracts and failure to treat them could result in blindness. This is an inherited disease which often affects both eyes the same way and is progressive – meaning it gets worse over time. The eye’s cornea is most affected by the condition and there are three specific types of corneal dystrophy: epithelial corneal dystrophy, stromal corneal dystrophy and endothelial corneal dystrophy. The first affects the part of the cornea where cells are formed, the second the part where the cornea will become cloudy and the third the cells lining the cornea. Another progressive disease which can lead to blindness, Progressive Retinal Atrophy (PRA) is actually a group of conditions which affect the eyes and worsen over time if untreated. They refer to the general wasting away of tissues in the eye.